As the need to protect declined, the use of Chateaux changed. The French kings and nobility used the Chateaux as a palace. No expense was spared and architects, designers and the best builders were employed to create "stately homes" (as in the United Kingdom). Many existing chateaux were converted to palaces, others were built from scratch. For example, the World Heritage site at Fontainebleau was started in the C12th. At one point in fell into disrepair but Napaoleon Bonaparte. Emperor Napoleon Bonaparte, began to transform the Château de Fontainebleau into a symbol of his grandeur. 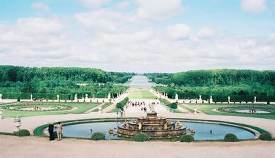 In 1624, Louis XIII ordered the construction of a hunting chateau at Versailles. In English the chateau is known as the Palace of Versailles but in France as Château de Versailles. There have been 4 phases of major construction over the centuries resulting in Palace and Park of Versailles - a World Heritage site. Another example of Chateau Palace is the royal Château de Chambord at Chambord, in Loir-et-Cher. It is one of the most recognizable châteaux in the world because of its very distinct French Renaissance architecture that blends traditional French medieval forms with classical Italian structures.